Social media event marketing is a natural combination of online and offline. 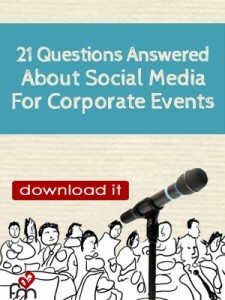 Learn ways to use social to amplify a corporate event. I’ve written a white paper to help event marketers leverage social media. There are many specialized areas of social marketing that have blossomed over the years – social customer experience, social advertising, influencer outreach, social media for non-profits… But nothing for corporate event marketers. Yet, event marketing is a foundational piece of a marketing roadmap. Whether it’s a user conference or the annual sales meeting, in-person is not out. Face-to-face meetings are still a necessary part of business and can be enhanced with, but not replaced by, digital communications. At least in my opinion, and this is coming from a person who really believes in technology! The practice of corporate event marketing lags behind. I think we all know that there are certain industries that tend to lag behind in digital. Early in my career I worked in wholesale and manufacturing – both of these industries are prime examples of late adopters. They were the last to be convinced to get a website in the late 90’s. Some haven’t tried Facebook to this day. I’ve observed that corporate event marketing lags behind in the same way. Social media amplifies brands during events. I know from experience! I’ve been fortunate to work on events with clients of my social marketing agency. We’ve managed end-to-end social media experiences for big corpo rate events, technology user conferences, and customer store events. I’ve also had the pleasure of personally hosting/co-hosting Social Media Day San Diego, business mixers and workshops. I regularly join gatherings with my social media friends for what we call “meeting IRL” (in real life) at meetups and tweetups. I’ve been on the other side of the event too, as an attendee with press pass credentials to live tweet or blog. I had a great experience live blogging as a guest contributor of Blogwell. All of this experience has culminated into social media event marketing methodology at Fandom Marketing. Now, I want to share it with you in my “21 Questions” white paper. It contains details on some of the practices used by my agency that event marketers can put to use right away. It’s free. You can sign up for our email list or not. I simply hope you enjoy it. All I ask is if you like it, share it.